The Hyundai Santa Fe is a weird SUV, but we say that in a good way. It’s always been a bit of the odd man out. The first generation had a very unique look to it that made people wonder if it was even an SUV at all. Then Hyundai switched gears with the Santa Fe and built a larger-than-average model that could fit three rows of seats, something you just don’t see in the compact SUV segment. 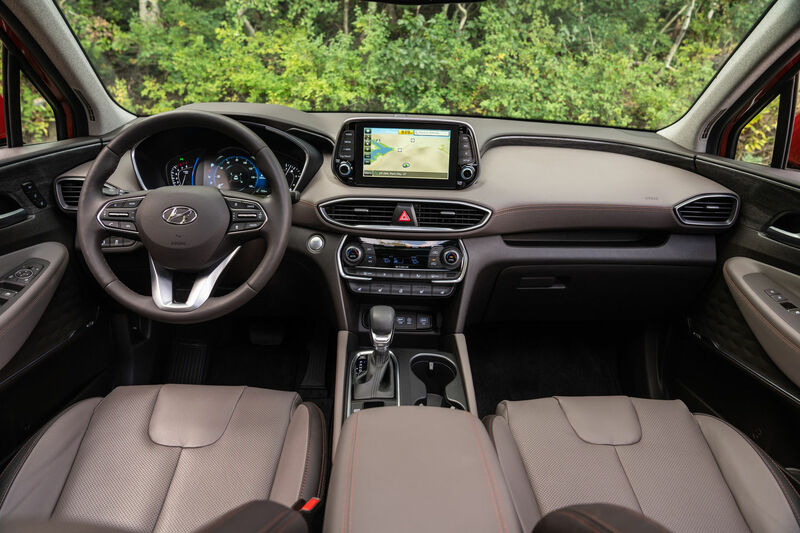 As one of the largest and most spacious vehicles in its class, the Santa Fe has had a lot of success on the market and Hyundai is hoping this all-new 2019 Santa Fe will continue the trend. It certainly has all the features you would want in a compact SUV, so we’re not too worried. 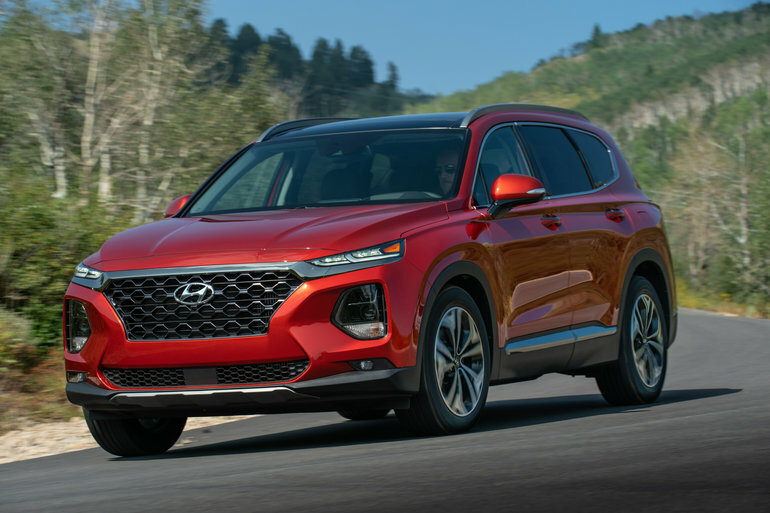 Hyundai has simplified its engine lineup for the 2019 Hyundai Santa Fe, and in the same vein made its popular sport utility vehicle more efficient. A new 8-speed automatic gearbox is now standard and can send power to either the front wheels in the entry-level Essential and Prefered models, or all-wheel drive in any of the models offered in the Santa Fe lineup. 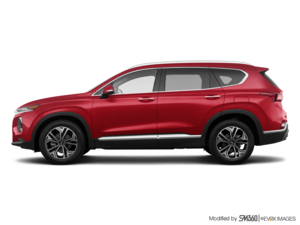 The 2019 Hyundai Santa Fe is powered out of the gate by a 2.4-liter four-cylinder engine that delivers 185 horsepower and 178 lb-ft of torque. This engine provides enough power for most needs although most buyers will go with the next engine in the Santa Fe lineup. We’re talking about the 2.0-liter, four-cylinder turbocharged engine that features 235 horsepower and 260 lb-ft of torque. With so much low-end torque, the 2019 Santa Fe just leaps forward and immediately puts the driver at ease. Passing is a breeze in the 2019 Hyundai Santa Fe, and the launch from any traffic light is simply satisfying. 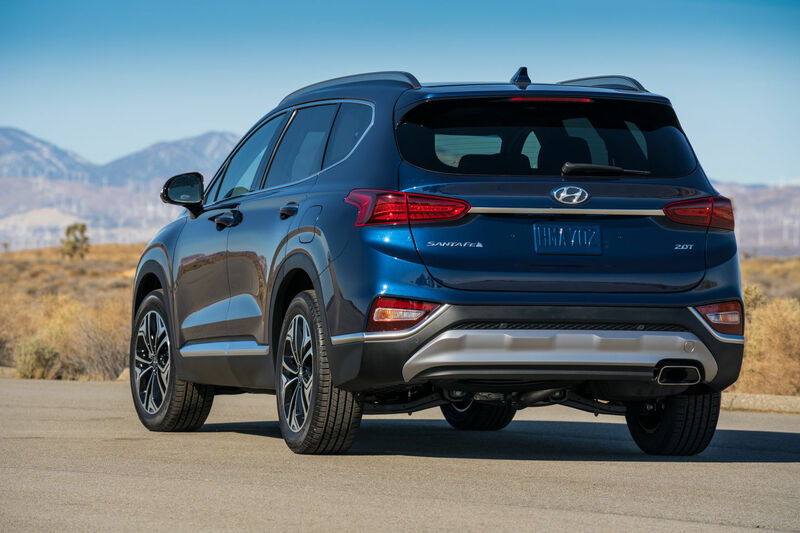 The 2019 Hyundai Santa Fe is therefore an SUV with a perfect blend of performance and fuel economy at a time when buyers don’t want to compromise and don’t need to. The 2019 Hyundai Santa Fe is brand new, but everything that made the previous generation successful is back. There’s a ton of space in the new Santa Fe, fold down rear seats with a wide range of hidden storage spaces in the trunk, and a ton of safety equipment. The seats provide impressive comfort and the cabin is as quiet as any luxury vehicle. There’s also a ton of versions in the Santa Fe lineup with plenty of standard and optional equipment. Connected, safe, spacious, efficient, comfortable and fun to drive, the 2019 Hyundai Santa Fe answers your family’s needs. Contact us today at Surgenor Hyundai to learn more.